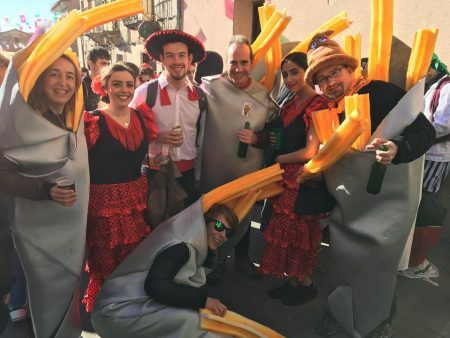 When most people think of Spain, one of the first things that they think is that the spanish are either sleeping (una siesta), or partying (una fiesta), and to be honest, it’s not too far from the truth! There are so many different festivals and celebrations that take place in Spain throughout the year, some which are famous and some which are less common. In this blog, I’m going to explore six different festivals, some which you may know and some which you’ve probably never heard of. El carnaval tiene lugar en febrero, y normalmente tiene lugar el fin de semana antes del empiezo de Cuaresma (Lent). En cada región de España hay una manera diferente de celebrar el carnaval. En general, el carnaval consiste de disfiles, de la gente en disfrazes de colores vivos, y un ambiente increíble. 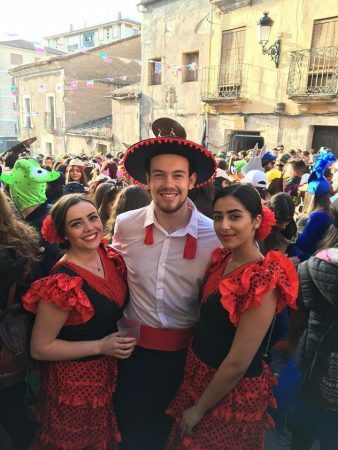 Yo fui al carnaval del toro de Ciudad Rodrigo con un grupo grande de estudiantes Erasmus. Básicamente, bebimos, bailamos y disfrutamos en la calle. Había unos eventos diferentes. Por ejemplo, música, encierro (running of Bulls in the Street) y un concurso (competition). Fue un día muy emocionante y memorable. La tomatina is a festival that I imagine you’ve heard of… if not, you’re missing out! La Tomatina takes place in August in a small town in Valencia (the same region as the Fallas), and has happened since 1944. 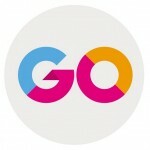 The event has become so popular in recent years that you have to buy a ticket in order to enter. The festival is supposed to start when one person has climbed a two-story high greasy wooden pole and touched the piece of ham that is situated at the top. Then, the one hour carnage begins. Before midday a truck delivers a load of tomatoes, and the festival consists of people picking up the tomatoes and throwing them at each other – it’s basically a massive food fight!! The interesting thing is that apart from being great fun, and a great excuse to throw a tomato at someone’s face, the festival actually helps the council to keep the streets clean as the acidity of the tomatoes on the floor acts as an annual cleaning for the roads! 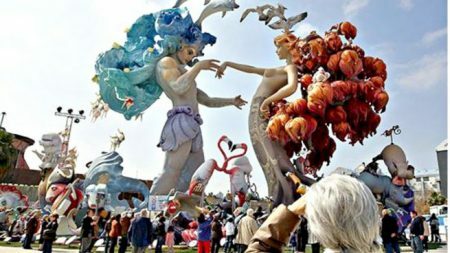 Las Fallas tiene lugar en Valencia, una ciudad en la costa este de España. Desafortunadamente, este año yo no puedo ir porque vuelvo al Reino Unido por el cumpleaños de mi mama. Durante el año, cada región de Valencia alberga (hosts) una variedad de eventos para recaudar (raise) dinero, y construir una falla. ¿Qué es una falla? Una falla es una construcción muy grande, como se puede ver en la foto. 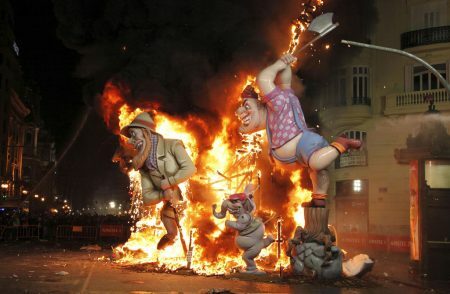 Durante las fallas de Valencia, hay fuegos artificiales (Fireworks), la gente tira petardos (firecrackers), hay un gran desfile donde la gente muestra su falla, y al fin del fin de semana, queman las fallas enormes. How much do you know about Spain’s obsession with bulls? Because it goes further than just bull fighting in bull rings! This festival takes place in Pamplona in North East Spain, and generally lasts for a week. On the opening day, there are fireworks and general partying, and every other day for the rest of the week follows the same pattern. 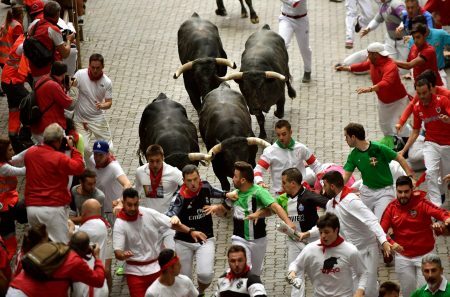 At 8am, the running of the bulls takes place. This means that the bulls are released in the street, and they chase people. I heard that it is the people’s job to try and lead the bulls to the bull ring by running in the right direction for the bull to chase them! At 6:30pm the same bulls participate in a bull fight at the city’s bullring, and in the evening the partying continues (without the bulls). Of course the event is very dangerous, and 15 people have died since 1910, most of whom were gored! 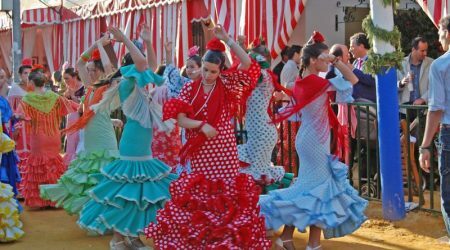 La feria de abril tiene lugar en Sevilla, una región muy tradicional de España. La feista comienza. Durante la semana, unas 5.000.000 personas van a la fiesta, y en la noche del viernes, ¡unas 850.000 personas van! ¡El presupuesto (Budget) es unos 3.000.000 euros! La gente lleva el traje corto, la ropa tradicional de Sevilla, y las mujeres lleman trajes de flamenca. I thought I’d keep the best festival til last… This festival takes place in Burgos in the North of Spain, and the title gives it away what happens. During the festival, men dress up in red and yellow masks to represent the devil, and run through the town shouting insults at and whipping villagers. Then, the ‘atabalero’ arrive who come to drive out the evil and a ‘fight of the devil’ takes place. 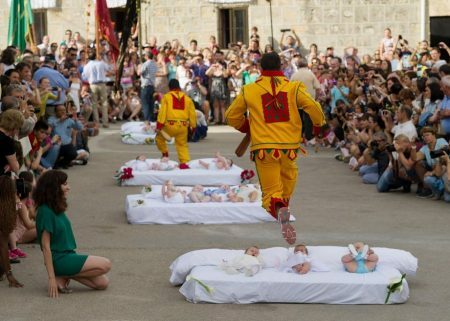 The event is supposed to be a sort of baptism, symbolising the devil absorbing the sins of the babies, and offering them protection from ill health and bad luck. How do they do this? Yep… by lying the babies down on a mattress and jumping over them!!! Life advice – if you’re going to have a baby, don’t have it in Burgos.